Samurai Girl: TOO MUCH FOOD!!!! Today, I saw my friends, Mayumi, and Maki;) They are my friends in high school, and we joined the same tennis club:D We are the best friends:) Mayumi works in mental hospital since she graduated from high school, and Maki studys to be a dental hygientist in technical school. We are spending time very hard and tired, but we had a nice time today:D We chatted a lot, shopped, and ATE TOO MUCH FOOD:O!!! We found a Tailand-style dessert shop and unique juice:P Lots of tapioca are inside. 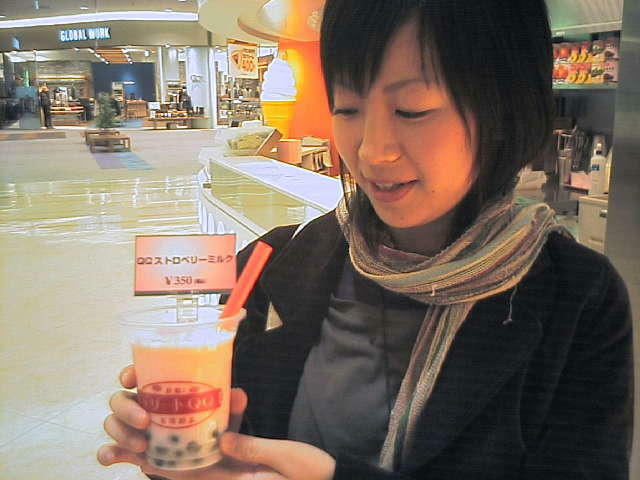 This picture is my friend, Maki who holding tapioca juice:) She is so cute! I ordered coconut milk taste, and Mayumi tropical fruit taste, and Maki ordered matcha taste. My juice is the most delicious:D It was the first time to drink such juice, and we enjoyed them first, but those tastes were verbose, so we felt uncomfortable soon. After we finally finish tapioca juice, Mayumi said "I'm still hungry! I wanna eat ramen*!!" 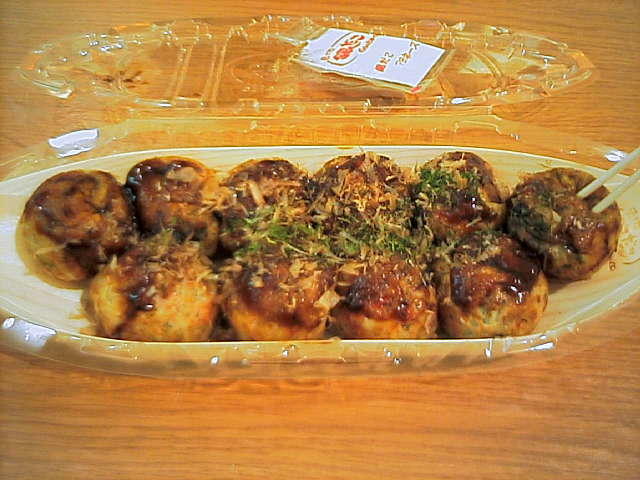 So I bought a big pack of takoyaki*! I love takoyaki so much:D!! Takoyakis are burnt cakes like balls that are made from flour, and pieces of boiled outpus are inside:) People eat it with mayonnaise, sweet special sauce, katsuobushi*, (pieces of dried bonito) aonori* (green laver) as they like. It's so sweet and delicious!!!!! 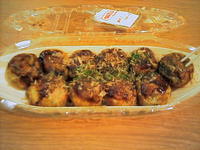 I love takoyaki as well as sushi of all Japanese food!!!!!!!!! Anyway, I had a wonderful time with them:D!!!! I wanna see them again as soon as possoble. I think that it's the best way and important to see friends if you're tired at daily lives:) I got vigor from them!!!! nice u seemed to have had a great time! Wow! Where did you put all that food! LOL! more food! i think i will have to check your blog everytime I am confused abour what to have for dinner. i like ramen (japanese ramen) so I think YOU are lucky to live in Hokkaido. You can also check my blog before you eat out with your friends!! Did you see my new blog style? Counter is so cute, don't you think:D?? New counter is so cute:D! Oh, let's go to eat an Indian Curry!! ...and Karaoke! Yeah! Why not!? I wanna go there:D! Wooo....Looks like u had an awesome time !! Plus, with friends it's alwez fun!!! Hey!!! Thanx for stopping my blog:D!! 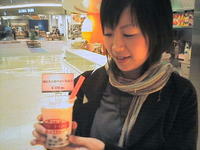 And sorry to be late for replying you X( The place that I had a drink with tapioca balls is in Tomakomai. Do you know Tomakomai? I live there. It takes for one hour from here by bus.....It's a little long way:P Sorry! But I tell you if I find such drinks sell!!! Come to my blog again:D! I found your blog through Tim's blog. I love the picture of your cat up at the top! My boyfriend's cat also likes to sit in the sink. I have a blog in Japanese but it is not very good. I am still just learning. Anyway, I love the drinks with tapioca in them! As for their taste, did you mean that they were くどい? In English we would say "heavy" instead of "verbose". Verbose means someone who uses too many words! Your English is much better than my Japanese. I will stop by again to read your blog!